Here in Ukarumpa there are different people with many talents who are willing to teach what they know to you. This was case when Susan and I decided to take a pottery class on two consecutive Saturday mornings. The high school art teacher put a posting on the community bulletin board asking if anyone would be interested in taking a pottery class for only the cost of the materials. Since there is not a lot else going on Saturday mornings (no cartoons) we though it sounded like fun. The first Saturday we spent an hour going over the basics of pottery working and talking about the different kinds of clay and how to work with it. Then we were turned loose to create something. Since they only have four wheels and there were about 12 people in the class we started with hand-built items. We both tried making vases, with mixed results. I honestly wasn’t super excited about the vase because I really wanted to make a bowl on the wheel. Susan’s vase turned out pretty good and should be large enough for the bouquets of flowers that we can buy at the market. Mine didn’t turn out the best, so I decided to let it be turned back into a lump of clay for someone else to make into a masterpiece. The second week was much more enjoyable for the two of us as we got to work on the wheel. 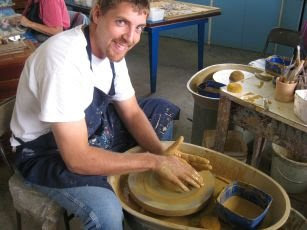 For me it was the first time to ever make something on a pottery wheel, but in no time at all I was getting the hang of it. Susan on the other hand struggled her way along. So after an hour and a half she only created one bowl. I, however, got two nice soup/cereal size bowls done and the teacher was very impressed! I too was proud of my accomplishment, especially since it was my first time ever doing this. I tried to make a bigger bowl, something we could put a salad in, but every time I would try to start making it big it would get a wobble to it and fall apart. So I only ended up with my two bowls. So the final tally is two bowls for Brian and one bowl and one vase for Susan. Not too bad for a bunch of beginners. Our art won’t be fired (the process of cooking the pottery at super high heat) for another month or two. The cost of operating the kiln is very high so they want to make sure that it is full before they run it. So the high school students will make things in their class once school gets started again (they are still on Christmas break) and then in late February or March our items will be finished and we can take them home. When we get our projects finished we’ll post an entry with pictures of the finished product. No way! I'm jealous. 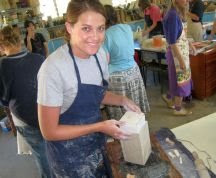 Pottery and throwing on the wheel are my favorite art mediums. Enjoy! It does add something to your regular cereal to be able to eat it out of a bowl you made yourself. Be careful with the vase, though. Even well fired and glazed pieces still tend to be somewhat porous and if they are left with water in them for extended periods of time, you can get seepage out the bottom. I've ruined a table top that way. I'm excited to see you have joined the world of blogging. I'm looking forward to hearing all about your adventures. I also have a blog (www.racethedawn.blogspot.com), in case you're bored someday.